By Juan Cole. This article was first published on Juan Cole. The Russian intervention in the Crimea is more direct and dramatic than the one in Syria, with actual troops deployed. But there are similarities. One of the little-noted rationales for Russian support for the Baath government in Damascus is that it is seen as more favorable, being secular and minority-dominated, toward Syria’s roughly 2-3 million Christians, the bulk of them Eastern Orthodox (i.e. the same branch of Christianity that predominates in Russia and among ethnic Russians in the Ukraine). Indeed, there are more Eastern Orthodox Christians in Syria than in Crimea. Russian President Vladimir Putin is giving as a rationale for troop deployments in Crimea that the ethnic Russian population there is in danger from Ukrainian nationalists. In both cases, Russia is exaggerating. The vast majority of Syrians who rose up against the Baath were moderates. Only when the regime of Bashar al-Assad responded to peaceful protests with massive military force did the opposition militarize, at which point Sunni extremists and al-Qaeda affiliates came to the fore as seasoned fighters with substantial Gulf money. Most oppositionists are still moderates and most Syrians want more freedoms, not a Taliban state on the Euphrates. The Russian official press often slams those who oppose its provision of huge amounts of money and arms to al-Assad as backing “al-Qaeda,” but that is propaganda. Likewise the popular movement in Ukraine against President Viktor Yanukovych was not primarily led or fueled by nationalist extremists. Most who went to the streets in Kyiv were disturbed at Yanukovych’s neo-authoritarian tendencies, his acquiescence in Moscow’s demand that he move away from the European Union, and his jailing of his opponent in the 2010 elections (Yulia Tymoshenko) on what seem likely to have been trumped up charges. There is zero evidence of ethnic Russians in Crimea being menaced by Ukrainian nationalists, but plenty of evidence of foreign Russian forces intervening there. Of course, now that Putin has violated Ukrainian sovereignty so blatantly, there could be a backlash against Ukrainian Russians; Putin might even secretly hope for such polarization as a pretext for further intervention. Those in the Middle East opposed to Russian backing for the Baath regime in Syria are also unhappy about the Russian intervention in Crimea. Turkey is the country with most at stake. In essence, it is surrounded by countries it which Russia has intervened, with Syria to its south and Crimea just across the Black Sea to its north. 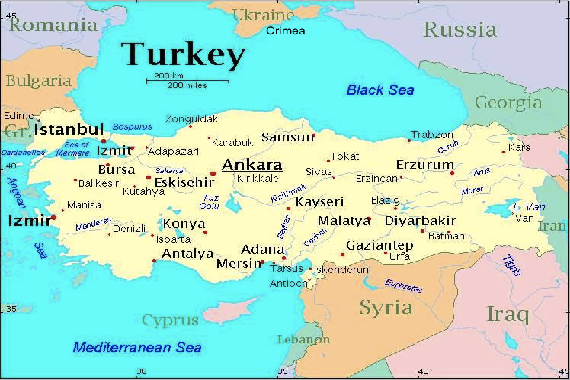 Turkey has a special interest in Crimea. Today, on the order of 12% of the 2 million residents of the peninsular are Tatars, i.e. Turkic-speaking Muslims, though before Russia’s annexation of the territory from the Ottoman Empire in 1784, it was all Tatar. Russians immigrated in (they are now almost 60% of the population, with a quarter being ethnically Ukrainian). Stalin ethnically cleansed the Crimean Tatars during WW II, but after the fall of the Soviet Union some 300,000 have gradually returned. Turkey is as interested in the fate of the Crimean Tatars as Russia is in that of the Crimean Russians. Moreover, Turkey is opposed to Russian policy in Syria. So it is no surprise that Turkish foreign minister Ahmet Davutoglu was in Kyiv this weekend consulting with the new Ukrainian interim government. Turkey is the world’s 17th largest economy (by nominal GDP), but cannot really offer Ukraine much beyond moral support itself. Still, it is part of NATO and the Crimea crisis will increase its worth in the eyes of that organization. Because the Turkish navy is on the Black Sea, NATO is on the Black Sea. Iran is likely to side strongly with Moscow in this crisis, and may benefit from it substantially. Of course, Iran is also concerned about the welfare of the Crimean Muslim community. But it should be remembered that Tehran has backed Christian Armenia against Muslim-majority Azerbaijan, so you can’t read off its foreign policy from its supposed Islamic commitments. China more or less defies the US on those Treasury Department sanctions, but Russia had in the past been willing to allow UN Security Council votes against Iran, which involved sanctions. If Putin now faces the same techniques from Treasury as Tehran has suffered from, he may well start protecting Iran at the UNSC and allowing Russian banks to do more open business there. (Before, they had to worry about being sanctioned by the US, but if they are already sanctioned, they may as well make some money in Iran). Russian firms like Gazprom may also decide to go in to develop Iranian natural gas, if they are under sanctions anyway. With rumors flying that Iraq may break US sanctions by purchasing Iranian weaponry, the current crisis could be another impetus toward Iranian reassertion, with Russian backing. Saudi Arabia and the Sunni Gulf oil monarchies of the Gulf Cooperation Council are already at odds with Russia over its Syria policy. They are also upset about the Obama administration’s negotiations with Iran. They are complaining about US disengagement from the region and ‘weakness,’ although the US has never intervened directly in eastern Europe and cannot be expected to. The GCC’s quiet support for the US invasion and occupation of Iraq demonstrates where they want to take US policy, and they seem unrepentant about that disaster, desiring a repeat in Syria. Egypt has sent delegations to Moscow in search of Russian weapons and support, and as a way of diversifying from its mainly American and Gulf patrons. To my knowledge the foreign minister, Nabil Fahmy (kept over in the new Ibrahim Mehleb cabinet just formed) has not said anything about Crimea. Likely Cairo will try to avoid annoying Putin, whose capitalist, nationalist neo-authoritarianism may be seen as a model for Egypt by its current elites. Still, if the US does sanction Russia, Egypt may be forced to reconsider buying arms from the latter. If Russia is pushed further into Tehran’s arms by US sanctions then ironically Bashar al-Assad and Sayyid Ali Khamenei may be the biggest winners of the Crimean crisis. At the same time, Turkey could also be a winner in the sense that its value to NATO, the US and the European Union will be much enhanced because of its Black Sea presence and its own historical interests in Crimea.